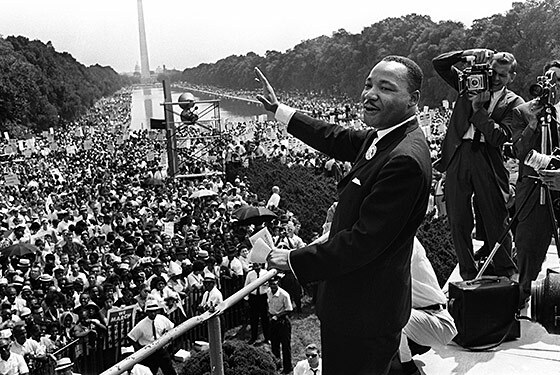 Find a way to give back to the community through the government’s MLK-specific service site. New York has opportunities such as donating coats with One Warm Coat, tutoring, and working in a food bank available. Kids learn and get in on the action with an interactive folk-tale performance, art workshop, and reading by Representative Yvette D. Clarke at this celebration of the life and legacy of the civil-rights leader. Artists Celebrate Martin Luther King Jr.
Representative Ruth Messinger emcees a free, multi-genre event featuring jazz by Craig Harris and musical excerpts from God’s Trombones, which brings to life the teachings of black preachers. Also on the roster are spirituals by members of the Green Pastures Baptist Church Choir and dancer Juel Lane performing pieces from Remembrance of Things Past. A historic tour through one of the most significant African-American neighborhoods, hitting hot spots like the Apollo Theatre, Billie Holiday performance space Lenox Lounge, and Blumstein’s department store, where an assassination attempt was made on King’s life in the fifties. Call 212-465-3331 for reservations. 25th Annual Brooklyn Tribute to Dr. Martin Luther King Jr.
Marty Markowitz and the Medgar Evers College of the City University of New York presents a packed day of free events, with a keynote by author Walter Mosely, musical performances, and a screening of Neshoba: The Price of Freedom, an award-winning documentary about a Mississippi town still divided by the murders of three civil-rights workers. The establishment of America’s most well-known gospel choir was inspired by a visit of founder Allen Bailey to a celebration in honor of Dr. Martin Luther King Jr. in 1986 at the Cotton Club in Harlem. Today, the group is made of singers and musicians from churches in both Harlem and the New York tristate area. Here, they play a special MLK matinee show. As part of their grand reopening, the museum screens the 1970 documentary, King: A Filmed Record … Montgomery to Memphis, which uses archival footage of the Reverend’s life, from the 1955 Montgomery bus boycott to his assassination in 1968, interspersed with interviews and readings by friends and admirers. The celebrated music aficionado and Roots drummer celebrates Dr. King’s legacy with a very special DJ set, taking us through the night to the holiday proper with the aid of his epic record collection. He’s joined by MC Yameen Allworld. Everything You Need to Know About Monday Night’s CNN Town Halls Highlights from the four senators and a mayor.